"I know he's never going to make it to daybreak because he's going to get run over by a cab." Picturehouse in the UK has unveiled a new trailer for the live movie Lost in London, starring and directed by Woody Harrelson. The film was originally presented as the first-ever "live movie", shown in theaters in January, when it was taped live and shown live to audiences all over the world. The film has now be repackaged and will be released as a standalone feature, for those who still want to check it out. Over the course of one night (recreating a story from 2002), Harrelson finds himself in a scandalous misadventure around London that eventually lands him in prison. This looks fun, with appearances by Willie Nelson and Owen Wilson. I've heard a few good things from those who saw it in January, and it seems like it might be worth watching. 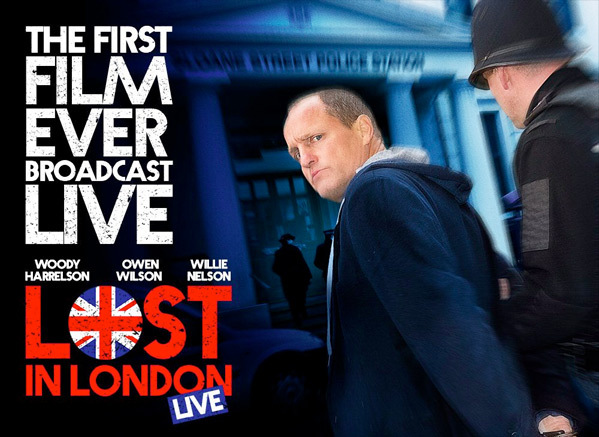 A comic re-staging of one crazy night in Soho in 2002, Lost In London follows Woody Harrelson, playing himself, as he struggles to get home to his family after a scandal threatens to ruin his marriage. Run-ins with royalty, friends and the law all seem to conspire to keep him from succeeding. Funny, charming and finally quite moving, Woody’s film ultimately proves much more than a dazzling technical exercise. Lost in London is both written and directed by actor Woody Harrelson, who also stars in the film, making his feature directorial debut. It was first presented as a live-streamed event in theaters on January 19th, 2017. Picturehouse will release Lost in London in UK theaters starting May 5th, but no US date has been set yet.